PayPal: I don’t have an account or don’t want to use it — how can I order? How can I purchase a hard copy book, delivered to my house? I’m not that computer savvy. Don’t you have just one hard copy laying around I can buy? Can I Read My How to Build a T-Bucket eBook on My iPhone, iPad, iPod? How can I download and read on my Amazon Kindle? Do your plans show how to build your own T-Bucket body? How do I get an eBook replacement copy? We use PayPal as our payment processor because with over 217 million accounts worldwide, PayPal is “the world’s most loved way to pay”. However, in case you do not have a PayPal account or you do not want to register with PayPal you have a quick and easy option to pay with your credit card. 1. Click on one of the “Buy Now” buttons. 2. 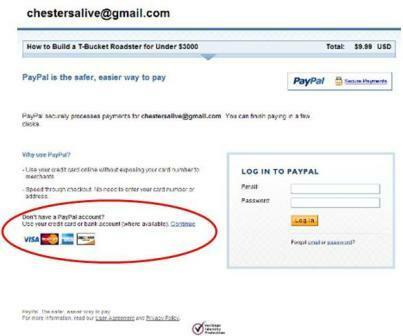 When you are taken to the PayPal page, do not log in to PayPal in the blue box. 4. Just click on the blue Continue link and on the next page where it says Pay With Credit Card or Log In just put in your credit card information without logging in. 5. Click Review Order and Continue and you’ve purchased your eBook without using a PayPal account or having to sign up with PayPal. We don’t have hard copies of Chester Greenhalgh’s books available because we’ve found the vast majority of people prefer the lower cost of the eBooks in addition to being able to immediately download the info. If we were to publish a paperback book, the printing and binding costs, inventory carrying costs, order fulfillment and shipping charges would mean we’d have to charge more than double. You’ll find the eBook downloads simple, quick and inexpensive . If you still don’t think your computer skills can handle ordering and downloading the eBook, we have a suggestion. Get one of your friends to sit down at your computer, buy it and download it for you. It will take less than 5 minutes and most people who know anything about computers can easily do it. So you want to download and read your How to Build a T-Bucket eBook on your iPhone, iPad or iPod? 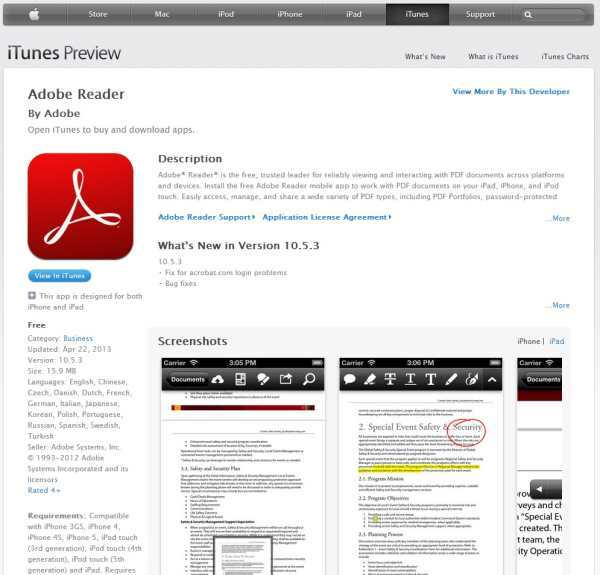 First, you’ll want to go to the App Store on your Apple device to search for and download the free “Adobe Reader” app. Be sure to do that before you click on the download link we email to you after your purchase. It will save you some frustration because if you don’t you’ll think that you’ve downloaded your eBook to your Apple device, but then you won’t be able to find it. That’s why you need the Adobe Reader app: it serves as a container as well as a reader for your How to Build a T-Bucket eBook. Of course, this also applies to our other how to build a T-Bucket and hot rod eBook plans like the California Customs Roadsters T-Bucket Chassis Plans, the Youngster FREE T-Bucket Chassis Plans, the Nostalgic Bird Automotive T-Bucket Plans, How to Build a Hot Rod or Rat Rod Truck for Under $3000 and Projects With Lawn Mower Engines. Once you have the Adobe Reader app installed on your iPhone, then open the email with the download link and click on the download link. The How to Build a T-Bucket eBook will open on your phone and you’ll see the cover page. After giving the book a few seconds to open in your browser, tap on the book cover and you should get a couple of buttons that will pop up and one of them will say “Open in Adobe Reader”. Click on that button and then the eBook should open in the Adobe Reader app. Give it a little time to be sure everything gets downloaded to your phone and then you’ll be good to go. So, when you want to open the book again just tap on the Adobe Reader app and the How to Build a T-Bucket eBook will be there in your documents and ready to read anywhere. (It’s a 20.2 MB file and 269 pages). Our eBooks are simple PDF files you read on any computer while the Kindle uses a file format exclusive to Kindle readers. Just remember that it might not look perfect on the Kindle compared to a PC, but it should be readable. No, because if you shop around T-Bucket bodies are so inexpensive ($400 or less) that it doesn’t make sense to try to build your own. And if you did, it wouldn’t look as nice and would have zilch resale value (unless you already happen to be an accomplished metal or fiberglass body builder — don’t even think about wood; if you don’t have compound curves it will look like junk). What our plans cover is EVERYTHING else involved in building a T-Bucket, which is where you’ll really spend big bucks if you don’t know the cheap and easy way to do it. It’s all spelled out very clearly in the Table of Contents. If your hard drive crashed or your computer was lost or stolen and you’ve previously purchased one or more of our eBooks, getting a replacement copy is easy. Just send us an email, using the email address that is tied into your PayPal account, and let us know what you need to replace. We’ll search our records to confirm and then send you a new download link email. Since our products are intangible goods that are digitally delivered, we do not offer refunds. Please review each eBook’s detailed contents and ask any questions you might have prior to purchase (we’ve been known to make exceptions for extenuating circumstances).